for 50% OFF ONLY $7 AFTER CODE FROM Gleam. Great fall color eyeshadow palette! 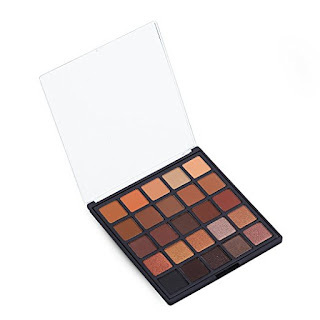 Professional eyeshadow palette: 18 colors matte eyeshadows and 7 shimmer eyeshadow in one makeup eyeshadow palette（Size:5.71 x 5.95 x 0.354 inches).The mix of warm and cool mattes with neutral shimmers eyeshadow palette perfect for everyday or night out use. 18 colors matte eyeshadow palette: matte bare canvas,matte soft neutral brown,matte chocolate brown,blackest black matte eyeshadow,brown matte eyeshadow, dark gray matte eyeshadow, deep brown matte eyeshadow, gold matte eyeshadow, gray matte eyeshadow, light yellow matte eyeshadow, light salmon matte eyeshadow, burlywood matte eyeshadow, peru matte eyeshadow, saddlebrown matte eyeshadow, sienna matte eyeshadow, tan matte eyeshadow, indianred matte eyeshadow, rosy brown matte eyeshadow. 7 shimmer eyeshadow palette: shimmery pink champagne,shimmery deep burgundy wine,shimmery warm copper,taupe shimmer eyeshadow,silver shimmer eyeshadow,brown shimmer eyeshadow,deep brown shimmer eyeshadow. Natural eyeshadow palette:using natural material,safe to use.Highly pigmented eyeshadow palette,long lasting.Suitable for neutral skin and oily skin ladies. Popular eyeshadow palette: Suit for different occasions, like casual, salon, party, wedding, etc.Perfect gift for girls,ladies,women,on her birthday,christmas day,mother's day,valentine's day etc. 25 4X6 Photo prints ONLY $.25! FREE 8"x10" Photo Print PLUS 50% off Everything Photo AT Walgreens! FREE 5×7 Custom Folded Photo Card PLUS 75% OFF Everything for the Wall! Enter to win a pair of Legging Army Leggings! 3 pack Sugar'n Cream yarn ONLY $2.99!